This morning we visit the Ridge, which offers magnificent views of the Nanda Devi. Later we proceed to the Golf course at Upat, the Government Fruit Garden and Research Station at Chaubatia. 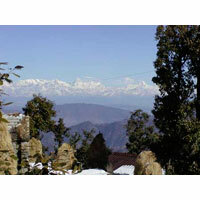 Our tour begins with a drive to Ranikhet where we will stay for two nights. 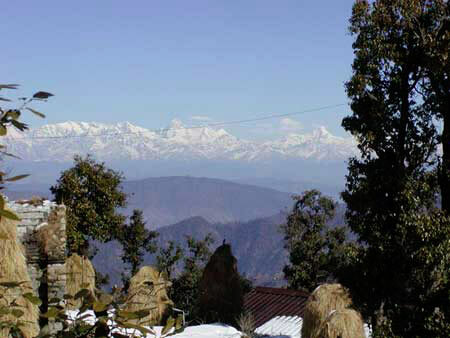 Ranikhet with its majestic pine trees is situated 59 kms. From Nainital. According to the popular legend, once a beautiful queen camped here amidst the nestling pine, and hence the name. This morning we will be driven to Nainital and upon arrival, will check in to our hotel for two nights. Set around the 1.5km long and 500m wide Naini Lake, is the charming hill Station of Nainital. In the evening we take a stroll down the Mall or take a boat ride across the lake. After breakfast we visit the Saat Taal (21kms) which are seven lakes including the jade green Garud Taal. Mountain biking and Rock Climbing for the more adventurous souls can be enjoyed here. Our journey this morning will bring us to Corbett where we will stay overnight. Take a jeep safari which is the best way to explore the jungle and its wildlife. The park is open from 15th November to 15th June. This morning we drive to Mussoorie Named after the Himalayan shrub 'Mansoor'. Mussoorie is spread out over 16km, along a horse shoe shaped ridge overlooking the Doon Valley. The rest of the day is at leisure. This day is at leisure for shopping. Take an optional tour to Kempty falls, a popular picnic spot situated 15kms away. After breakfast proceed to Delhi. Full day at Leisure.